The second game of the season-opening doubleheader matched the brand new Denim Demons against the brand new Toxic Shocks. 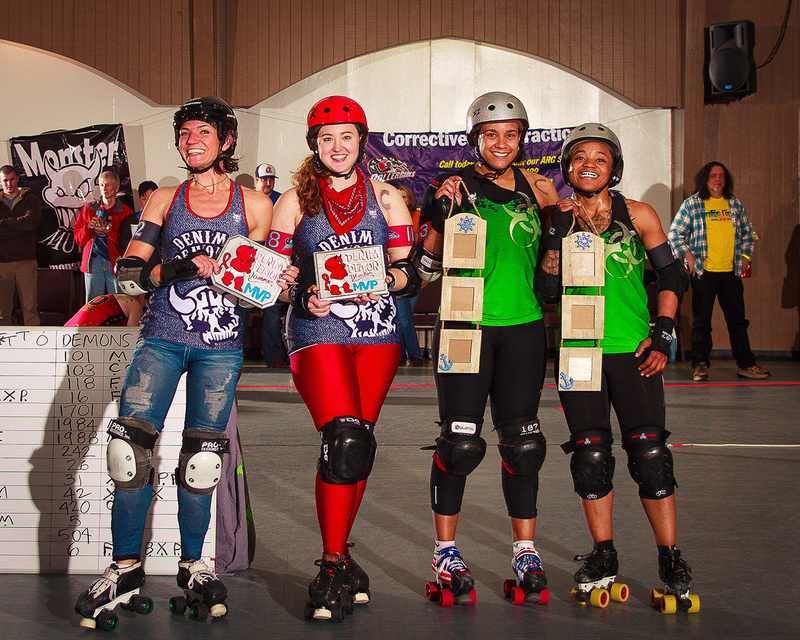 Both teams are anchored by Team USA all-stars, with Wild Cherri returning to the Demons and transfer Baller Shot Caller joining the Toxic Shocks, and both lived up to their reputations by delivering some spectacularly showy blocks during this bout. The Demons, skating without their Captain Nattie Longlegs who was ill, took off to an early but narrow lead. A Shocks jammer penalty in the 7th jam gave Demons jammer Choke Cherry an opportunity to extend a 20-19 score to a 35-23 Demons advantage. Lighting-fast and powerful defense by Wild Cherri coupled by some well-timed offense by Totalitiffian helped the Demons hold on to lead for most of the first half, but the Shocks slowly chipped away at the margin. An unanswered 9 points by Shocks jammer Nora Gretz in the 16th jam brought Shocks within one point and the momentum decidedly shifted. Shocks jammers Afro Dykee, Nora Gretz, and Genie in a Battle turned three consecutive lead-jammer calls and a power jam into an unanswered 37 points. The half ended 61 Demons- 97 Shocks. The second half began with a Shocks power jam, giving them a chance to extend the lead to 61-112. Shocks and Demons jammers traded leads at a fairly equal rate in the first half of the second period, but awesome Shocks defense anchored by Baller Shot Caller and offense by Ozzie Kamikaze prevented the Demons from converting lead jammer status into the points they needed. A Demons jammer penalty in the 4th jam gave Shocks Jammer Afro Dykee a chance to put up a cool 15 points, then the Shocks held the Demons scoreless for five consecutive jams and extended their lead to an almost insurmountable 157-73. The Demons rallied about midway through the second half with a series of lead jam calls, allowing them to match the Shocks point-for-point in jams 9-14, but they could not close the gap in the score. The Shocks were consistently able to do more with their leads and pack advantages, outscoring the Demons about 2 to 1, and they steadily pulled further away. The final score was 226 Shocks – 113 Demons. 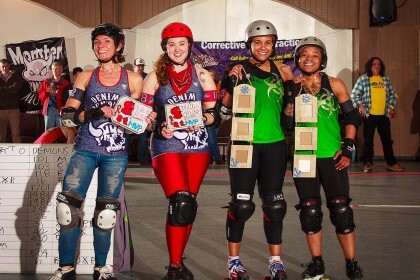 MVP blockers were Helga G. Pa-Smack-i for the Demons and Baller Shot Caller for the Shocks; MVP jammers were Nutella Ferraro for the Denim Demons and Afro Dykee for Toxic Shocks.